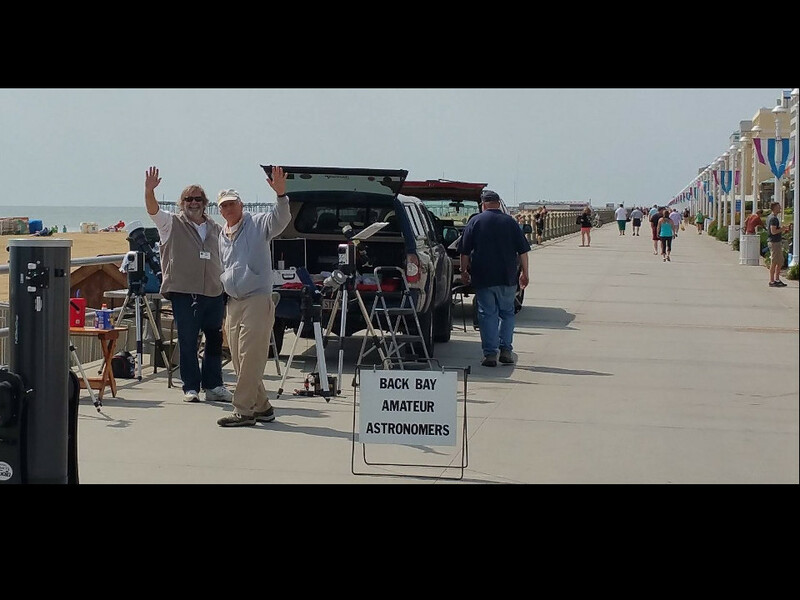 "Bringing Astronomy to the People of Hampton Roads"
We are a group of dedicated amateur astronomers drawn together by a common interest in astronomy. 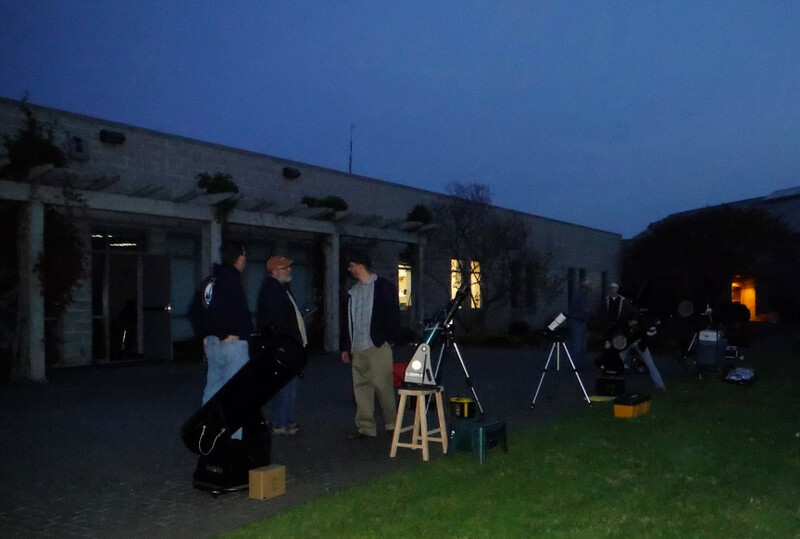 Our club was founded on December 14, 1978 by members dedicated to promoting amateur astronomy. We invite you to come to our any of our free monthly events to take a look through our telescopes and learn more about the night sky. The BBAA is an active member society of the Astronomical League, a part of the Night Sky Network, and a member of the Virginia Association of Astronomical Societies (VAAS). We are also active on social media. Please visit our social media pages on BBAA Yahoo Group, BBAA Facebook Group, BBAA Twitter page, BBAA Facebook page and Instagram to stay up to date with our club's latest activities. The public is invited to come to our free monthly Skywatch event at Northwest River Park in Chesapeake to take a look through our telescopes at planets, galaxies, star clusters, nebulae, and more! Come learn about the sky and about your place in the Universe. In addition we also hold a monthly event called Saturday "Sun" Day at the Elizabeth River Boat Landing and Park in Chesapeake that lets visitors see the Earth's closest star, the Sun. See our Events Calendar for scheduled dates and more information. Other regular public events include Gardens Stars at the Norfolk Botanical Garden and Night Hike at Northwest River Park. During the height of the tourist season, we collaborate with the Virginia Beach Planetarium and the City of Virginia Beach to host Boardwalk Astronomy on the Virginia Beach boardwalk (near the 24th Street stage). We also do many other outreach events throughout the year at city parks, local schools and libraries. If you have any questions about scheduling an event please send an email to our Outreach Coordinator. Events marked with * below are free, kid friendly, and open to the public. Events marked with $ below have a fee charged by the event host. Events that are for club members and their guest only are noted in the events descriptions below. Our Outreach Coordinator will go over the details of your event to ensure that our schedule permits us to attend and that viewing of the sky will be possible during the times requested. Be sure to check when the Sun sets on the day for your event to ensure that we can see the night sky. At a minimum planets will not be viewable until at least 30 minutes after sunset and we can't see stars or dim objects until an hour after sunset. The Outreach Coordinator will add your event to our club calendar and send you an email telling you that your event is on our schedule or they will email you a response telling you why we cannot attend your event. To ensure your event is successful for astronomy viewing you can review our event guidelines and etiquette documents located at the bottom of this page or you can download a PDF from our documents page. If you are a for profit organization and would like the BBAA to attend your event we ask for a donation. Those donations are applied to our club's scholarship funds which help graduating high school seniors offset the cost of college during their first year. Skywatch is our free public observing program held once each month at the equestrian area of Northwest River Park in Chesapeake. BBAA members set up telescopes to share the view with visitors. Everyone is welcome, and no reservations are required, although prior notification for large groups such as scout troops or classes is appreciated. The event runs from dusk until midnight. Visitors are welcome to arrive and depart at any time during the event. For those who would like some help with new telescopes or just want to learn how telescopes work, we hold an informal “Telescope 101” pre-event beginning about 60 minutes before sunset (scheduled start time). Please feel free to come out early with your new telescope and let us help you learn how to use it. Nightwatch is our "observer's only" session for club members and their guests at Chippokes Plantation State Park near Surry. The session runs from dusk until dawn. Our night use of the park requires a permit and at least one copy of the permit must be present during the event. Members are asked to put a 9' x 11'' sign with "BBAA" in large letters on the dash of their vehicles and pay the $3.00 entry fee at the main gate. Our night use of the park requires a permit. Click here to log in to NASA's Night Sky Network to download the permit. Garden Stars is a joint program of the BBAA and the Norfolk Botanical Gardens. Members of the public wishing to attend must sign up with the park and will be charged a fee. BBAA members set up telescopes to give sky tours to the patrons. A short PowerPoint presentation is delivered (by a BBAA volunteer) on an astronomical subject prior to the telescope session. The session starts about an hour before dark and the end time is variable. The BBAA club member who coordinates this event for us is George Reynolds. This event is NOT weather dependent and the presentation will be given without viewing through telescopes even if the weather doesn't cooperate. Night Hike is a summer program offered occasionally by Parks, Recreation, and Tourism department in Chesapeake. Hikers sign up in advance and pay a small fee. They are led on a nature hike by an amateur naturalist that highlights the natural nighttime environment. It culminates with a stop where BBAA volunteers have telescopes set up and offer sky tours. Hikers should contact the park at (757) 421-7151. Saturday "Sun" Day is a free monthly solar viewing program held year-round and offered by the Chesapeake Parks, Recreation, and Tourism department. Everyone is welcome to attend. 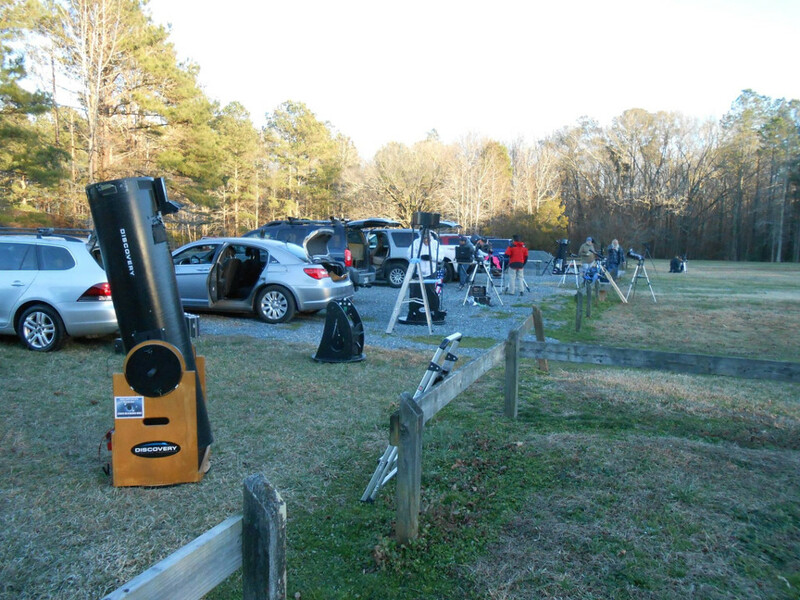 Amateur astronomers set up their telescopes at the Elizabeth River Boat Landing Park with solar filters and purpose built Hydrogen-Alpha Solar Scopes for the public to view the Earth's closest star - our Sun. Boardwalk Astronomy is held during the height of the tourist season from the month of May through September near the 24th Street stage area on the Virginia Beach boardwalk. The BBAA provides this exciting opportunity to bring astronomy to the people of Hampton Roads at the invitation of the city of Virginia Beach Parks & Recreation department and of Virginia Beach Planetarium director, Chuck Dibbs. BBAA club members set up their telescopes for views of the Sun during the day and any available planets and the Moon after dark. 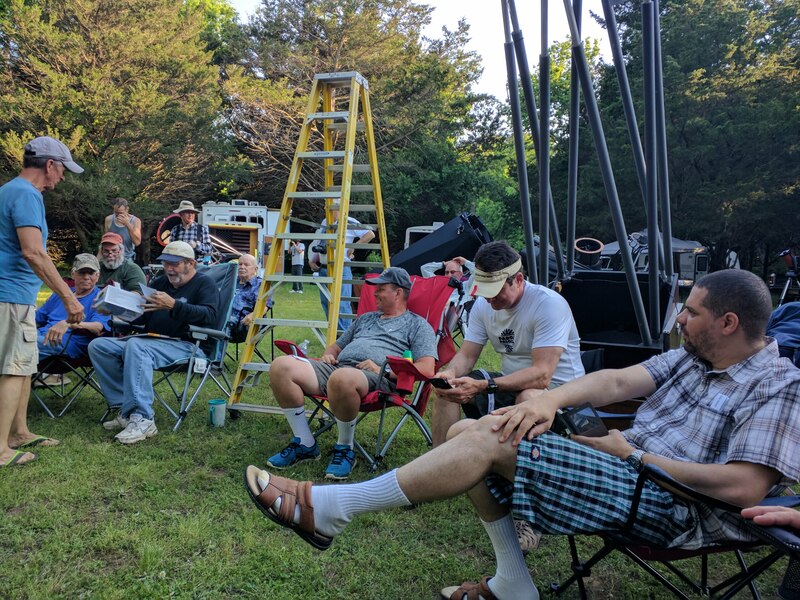 East Coast Star Party (ECSP) is hosted by BBAA member Kent Blackwell at the Hampton Lodge Campground in Coinjock, North Carolina twice each year. Enjoy an intimate star party in the cedars under magnitude 6.3 skies. The party is scheduled in the spring and in the fall and attracts observers from as far away as New York. Held over a weekend, Kent always hosts a Saturday afternoon cookout where he provides the hot dogs, hamburgers and soft drinks. Many attendees add their own dishes and the event usually turns into a grand pot luck feast. Visitors that leave by midnight can attend the observing session for free. Overnight campers pay a reduced star party rate. There are door prizes available to registered guests. Most ECSPs feature at least one vendor. All are welcome but space is limited and is first come first served. This event is NOT weather dependent and is held rain or shine. Cornwatch is our "observer's only" session for club members and their guests held at Cornland Park in Chesapeake. This is where we can work with new members on using their equipment or just getting together. The session runs from dusk until dawn. Our night use of the park requires a permit. Click here to log in to NASA's Night Sky Network to download the permit. Help us fulfill our club motto of "Bringing Astronomy to the People of Hampton Roads" by supporting our outreach events and donating your time, resources, or both. Thank you! Donations to the Back Bay Amateur Astronomers are tax deductible as charitable donations on the donor's federal income tax return! To download a PDF version of this information please click here. We all want to have a great time at each event. Please follow these simple rules that keep things fun for everybody. No running or playing around the telescopes. It’s dark, and someone might get hurt or damage the telescopes. Try not to kick up dirt. The dust and sand can be harmful to telescope optics. Ask before you touch a telescope. They move very easily. These scopes are the personal property of the astronomer, and many were handmade. Let’s be extra careful with them. It is never necessary to grab the eyepiece, as looking is done with the eye. The image is always formed above the glass surface of an eyepiece; your eye should not contact it. Please ask before attempting to adjust the focus of a telescope. If the image is blurry ask the astronomer for assistance. Many focuser's can be locked and damage can occur if focusing is attempted while locked. Be careful when moving around or approaching a telescope. There may be electrical wires or other trip hazards on the ground leading to the scope. Be careful not to bump the scopes. You could knock the scope off its target or even cause damage to its drive system. No white lights around the telescopes after dark. It takes 30 mins for your eyes to adjust to the darkness and less than a second to lose your night vision. We always cover our lights in red to make them “night vision friendly.” To fully enjoy the experience, observers need to be dark adapted and do their utmost to preserve the dark environment. But of course, safety must come first! The best light to use is a variable red LED flashlight. Give yourself time at the eyepiece. Your eye needs a few seconds to get used to looking through the scope. Your view of detail will improve after just 5 seconds. If you don’t see anything, don’t be afraid to say something. Sometimes the scope gets bumped or the object may drift out of view. If you can’t see, speak up! We really want you to enjoy the view. Ask questions! Astronomers love to answer questions. Don’t stand in front of a telescope. You’d be surprised how many people do. Be sure to look through each scope. Each telescope gives a different view even when they are all pointing at the same object. Green laser pointers are permitted, but they should be used carefully and never by children. They are not toys as they can cause considerable damage to the eye. The BBAA does not generally provide refreshments or snacks at events. If food or drinks are shared they are offered by individuals, and are enjoyed at the user’s own risk. Visitors are welcome and encouraged to bring their own snacks and drinks to events. No food or drink around the telescopes. Accidents happen. Let’s not take any chances. Bringing a pet to observing sessions, while not forbidden, is also not encouraged. If you must bring your pet, be sure you can control the animal and keep them away from the telescopes, food, and other guests. Please dress appropriately. In warm months, you should expect to encounter mosquitoes and other biting insects, especially at dusk. The less skin exposed the better; shorts are never recommended. Always come prepared for cooler than expected temperatures even in summer. In cold months be sure to dress in layers and wear a hat. Please avoid spraying bug sprays in the vicinity of the telescopes. The chemicals in the sprays can damage the optics of the telescope. You may have to climb a ladder to reach the eyepiece for larger scopes. Many telescopes require the use of a foot stool or ladder to view through the eyepiece. If you need help on them please ask for assistance and use them carefully. You should hold onto the ladder and not the scope. You observe at your own risk! The BBAA assumes no responsibility for any injury, damage, or loss. Please do not smoke near the telescopes. The smoke will attach itself on the mirrors of the telescopes and its a lengthy process to remove and clean the mirrors. The telescope field needs to have a clear view of the sky where the Sun is located away from tall buildings and trees. Volunteers usually need vehicle access to the field, since some telescopes are very heavy. The volunteers park in the same location that their telescopes are set up at to facilitate unloading and loading of the equipment. If this isn’t possible please let our Outreach Coordinator know (vp@backbayastro.org). Club members always appreciate the offer of water during the summer months. When planning the location for us to set up, please take into account that members need room around each piece of telescope equipment for people to line up, that is not blocking traffic or impeding another member’s view of the night sky. A good guideline is that each telescope and associated equipment needs its own parking spot for this purpose and another parking spot for the volunteers vehicle. The telescope field needs to be as free as possible of lights, away from tall buildings and trees. The telescope field should have as clear a view as possible of the southern and western sky. Ask the custodian if it is possible to turn off or cover lights that will interfere with viewing. What equipment do you have available (Projector, laptop, classroom, etc.) for club members. Do you have a preference on the topic. *NOTE: Our club will usually have a table and a banner setup at events with material provided by a partnership with the NASA's Night Sky Network. To see a breakdown of the materials the BBAA has received from NASA's Night Sky Network and available for presentations click here.